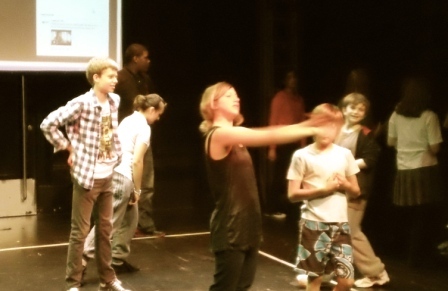 This clip shows excerpts from the final sharing of work at Half Moon. The diverse exercises carried out by the participants to explore fearful and everyday place are brought together and shared with an audience through the frame of a day in the life of the participants. From the eating of breakfast in the morning, through going to school and coming home, this framing allows the processes of the work to be shown in a coherent form to an external audience. The ideas of place are introduced to the audience for the final performance of the work through a series of interviews conducted by researchers, which explore individuals’ perceptions of what place is and means to them. Responses to the work are also gathered through a twitter feed present in the foyer and post show questionnaires, allowing greater understanding of the impact of the work. The audio clip is a selection of audience responses to questions around place which can be activated by clicking the play button above. In this particular sharing of work, in addition to the performance in the theatre space, film and performers are placed in the foyer area of Half Moon, so that this place is also changed and re-performed. Film footage taken during sessions, but not used in the performance (see On Sites / 2. Scattering Cornflakes and 3. The Lost Boy), is projected in the foyer, so the audience can get a flavour of the work before seeing the performance itself. 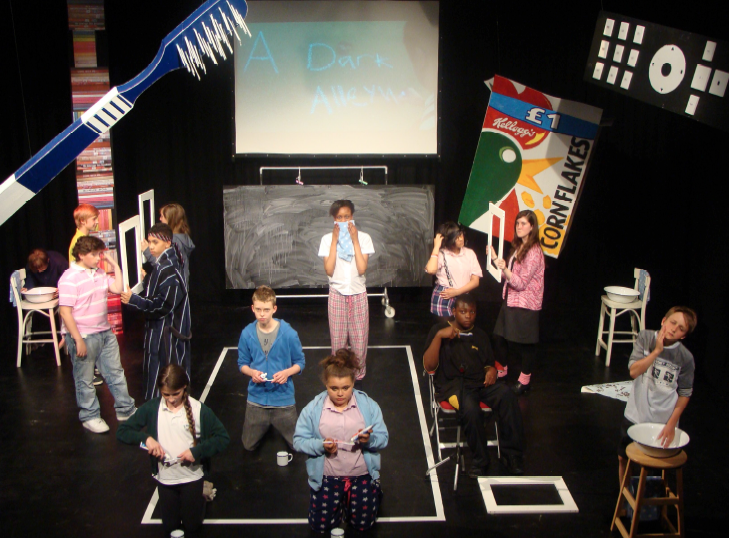 In addition the performers are positioned around the space prior to the show, in their ‘disrupted’ costumes which mix everyday items of school uniform and pyjamas. In the final performance of work at Half Moon, a range of digital content is utilised in conjunction with the performance of the participants in the space. This includes filmed material from the exercises described in the Half Moon: On Sites section. It also includes the live mixing of digitised sound by Patrick Furness, allowing the soundtrack to be responsive to the work of the participants. Questions about Digital Place had arisen during the workshops – e.g. to what extent did young people inhabit digital places? The use of the digital was highlighted throughout the process as part of this thinking about digital places. It was appropriate to reflect this in the final performance sharing.